This model 1101 Super Air Nozzle requires 14 SCFM @ 80 PSIG. How much air will it consume at 60 PSIG? Compressed air driven devices are always given a specification for the compressed air flow at a certain pressure. 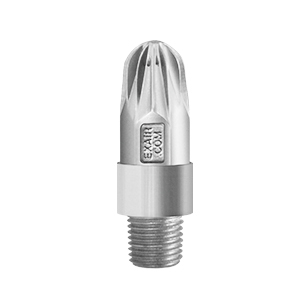 For example, an EXAIR model 1101 Super Air Nozzle has a specified flow of 14 SCFM at 80 PSIG. This means that when this nozzle is operated at 80 PSIG, it will require 14 SCFM of compressed air flow. But what if the force from the nozzle is too high when operated at 80 PSIG and a lower operating pressure is needed? Thankfully, we can calculate the compressed air flow at a different pressure using the absolute pressure ratio. The absolute pressure ratio says that for any given change in absolute operating pressure, there will be a proportional change in the air consumption of a device. So, what is an absolute pressure? Put simply, an absolute pressure is the value which you would measure on pressure gauge plus the atmospheric pressure (PSIA, or Pounds per Square Inch Atmospheric). So, our 80 PSIG operating pressure mentioned above is an absolute pressure of 94.5 PSI (80PSIG + 14.5 PSIA). Similarly, if we wanted to determine the compressed air flow at an operating pressure of 60 PSIG, our absolute pressure would be 74.5 PSI (60 PSIG + 14.5 PSIA). Utilizing this formula allows us to truly compare a compressed air powered device at different operating pressures. If we did not use the absolute pressures when comparing compressed air devices at differing pressures, our values would be erroneously low, which could yield to improper compressed air system planning and performance. And, using the absolute pressure ratio allows anyone to make a true comparison of compressed air device performance. If specifications are given at different pressures, performance data can be misleading. But, by using the absolute pressure ratio we can make a more exact evaluation of device operation. If you have a question about your compressed air device and/or how a change in pressure will impact compressed air flow, contact our Application Engineers. We’ll be happy to help. 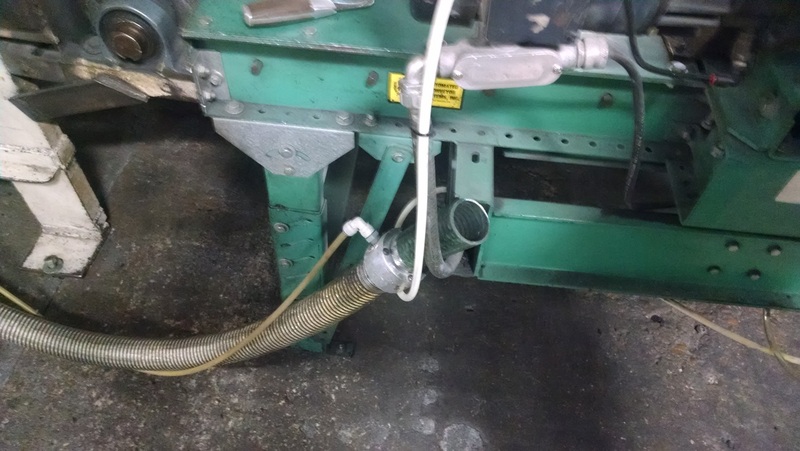 Sometimes we get calls or emails from our customers experiencing a problem with their application already using EXAIR products. These calls can range from difficulties associated with installation angle, installation, or, in many cases, the compressed air plumbing to the product itself. That was the case in the application of the photos above. 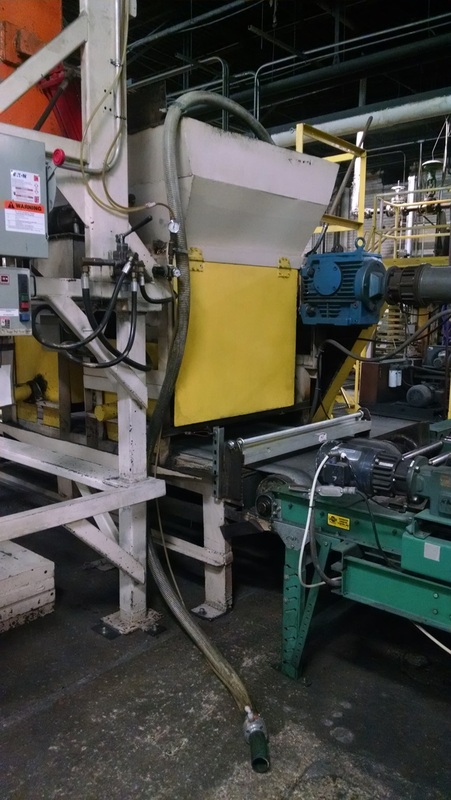 The end user had been using our model 6084 Line Vac to move plastic pellets from the floor to the top of a machine hopper, and they needed to increase the flow. The problem, was that they weren’t getting the performance from the 6084 that they thought they should. Given the bulk density of the plastic pellets in this application, the end user should’ve been able to move more than enough material in the time they desired for the application needs. 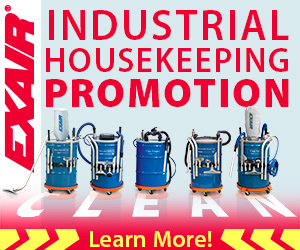 But, instead, the Line Vac was moving little-to-no material and even “stalling” – a condition in which the conveyed material could enter into the Line Vac and then cease to convey. What we found, after exchanging contact information and discussing the photos above, is that the compressed air line feeding the Line Vac is too small, creating a pressure drop and leading to an inadequate compressed air flow. This, in turn, leads to lower air velocity at the exhaust of the Line Vac, which simultaneously means lower vacuum and material flow at the inlet. The end result is the condition described by the end user – a low flow, or no-flow, of the material being conveyed. After our discussion the end user set out to make the required change to the supply line, providing proper flow to the Line Vac at the proper pressure, and moving the material as required. It’s always rewarding to help an end user solve their problems. 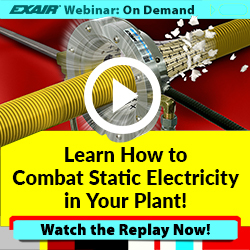 If you have an application problem and think EXAIR might be able to help, contact an EXAIR Application Engineer.